A Vancouver Section member is the first NSERC Chair for Women in Science and Engineering to be a professor in computer engineering. Creating Connections 4.0, held May 22 & 23, at Simon Fraser University. 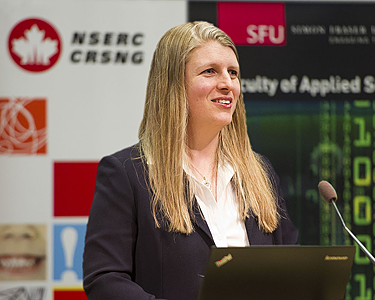 Dr. Lesley Shannon's announcement as incoming Chair holder for B.C./Yukon was made May 22 at Creating Connections 4.0, a national conference for women in science and technology held at Simon Fraser University (SFU) for which she was principal organizer. Dr. Shannon is an associate professor with SFU's School of Engineering Science. The outgoing Chair holder is Dr. Elizabeth Croft, professor of mechanical engineering at the Faculty of Applied Science at the University of British Columbia, and also an IEEE Vancouver Section member. "Too many girls think because they didn't study computer programming in high school they can't pursue computer engineering or computer science at university," Shannon says. "I want to change that perception." At SFU she has already gone a long way to doing just that. Since her appointment in 2006 she has doubled the level of female enrolment in computer engineering. Changing perceptions is a huge part of Shannon's mandate as NSERC Chair for Women in Science and Engineering (CWSE). "Improving awareness, recruitment, retention, and networking for women in STEM is pretty much my job description as Chair," Shannon says. Outreach to K-12 teachers will be a major focus of her work, including partnership with the B.C. Science Teachers' Association and Science Fair Foundation of British Columbia. At the industry level, plans are already well underway for a mentorship program with Vancouver-based software company Simba Technologies Inc. The company will be bringing young women on site to engage with female engineers and ignite their interest in career opportunities in the field. Simba is providing funding of $175,000 towards the NSERC CWSE Chair at SFU. Partnerships are essential to the success of the CWSE program, Shannon says. To date, some additional organizations she has established links with include: Society for Canadian Women in Science and Technology, APEGBC Division for the Advancement of Women in Engineering and Geoscience, Yukon College Science Adventures, IEEE Vancouver Section WIE and the City of Surrey Innovation Boulevard. IEEE Vancouver WIE has a history of collaboration with the CWSE BC/Yukon Chair, gratefully receiving funding in 2011/2012 for a multi-level outreach program. 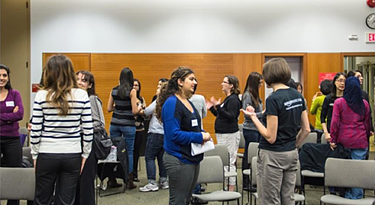 Spearheaded by former Vancouver and IEEE Canada WIE Chair Zahra Ahmadian, activities included a hands-on lab project for high school students at the UBC campus as well as a networking night for WIE members with Amazon. Current IEEE Vancouver WIE Chair Parastoo Dehkordi is keen to explore the possibility of future partnerships with the incoming Chair. "Vancouver WIE volunteers are always looking for ways to foster equal opportunities for women in engineering and technical fields," Dehkordi says. WIE Vancouver members at "Networking Night with Amazon"
As IEEE Canada WIE Chair, Dr. Janet Light has similar professional interests to Shannon, being professor and department chair, Computer Science, at the University of New Brunswick. Through events such as 'Women in IT' she has encouraged Grade 9 girls in the Saint John area to pursue computer science and engineering as their career choice. Light notes that computer engineering is one of four occupations highlighted by a just-released Engineers Canada Labour Market Study that will see significant retirement increases. Electrical/electronics engineers is another job category to be impacted by aging baby boomers, according to the report. "Networking among WIE Chairs and coordinated efforts from IEEE Canada members can help ensure more women fill these vacated positions, and encourage more women to enter into the entire engineering work force," Light says. Founded by NSERC in 1996, the CWSE program is structured with five Chairs representing the regions of Atlantic Canada, Quebec, Ontario, Prairies and BC/Yukon. Chairs receive $95,000 annually from NSERC, matched by cash contributions from corporate sponsors. Chairs hold their positions for a period of five to 10 years. As B.C./Yukon Chair at SFU, Shannon's teaching duties are reduced, though she retains the same high level of research activity in her areas of interest: primarily non-traditional computing system design with a focus on improving computer speed and power.